Refurbishment is a broad sweeping term in the building industry for improvement projects of all types ranging from small to large in size and from simple decorative repair to complete restoration and on-going maintenance work. But whatever the scale and type of project, flooring is a fundamental component of improvement work across both the contract and housing sectors, and an essential factor in both visual and functional enhancements. However will Brexit take its toll on construction sector output and consequently impact on repair and maintenance programmes? According to the Office of National Statistics (ONS) construction sector output dipped by 0.2% in November 2016 compared with the previous month largely due to a contraction in non-housing repair and maintenance. However a three month on three month pattern shows only a 0.1% contraction. But repair and maintenance provides the largest downwards pressure with construction output falling by both month and year. Nevertheless, construction product sales – both light and heavy – were healthy in the last quarter of 2016. As flooring is a comparatively low budget refurbishment material, there may be greater opportunities for tried and tested flooring solutions that save both installation time and money, reduce downtime dramatically and have the aesthetics and technical performance to meet the needs of specifiers, installers and end-users when time and budgets are tight. It is also true to say that some construction sectors are doing better than others. For example, the conversion of existing, commercial buildings into residential homes is buoyant and is helping the government reach its new housing targets. The government’s Priority School Building Programme (PSBP) is addressing the needs of schools most in need of urgent repair and the remodeling of healthcare buildings is on-going. Even if the new-build construction market shrinks further, refurbishment remains an important element and business can be capitilised upon in competitive markets by combining the right expertise with the right flooring product solutions. The correct choice of flooring can add value to any refurbishment project and provide longer-term solutions. Innovative floorings that couple aesthetics with technical performance are therefore key in a competitive market. Contract floorings for healthcare, education and other public buildings must meet or exceed the highest standards in safety, durability, cleanability, sustainability and contribute to good air quality, also providing extra performance characteristics like acoustic, shock absorption or conductivity resistance where needed. For example, heterogeneous, compact vinyl floorings with good abrasion resistance, dimensional stability, added comfort, resistance to static and dynamic loads, quick indentation recovery and super infection resistance, perform well in hospitals. Moreover the maintenance costs of refurbishment materials are important budget and environmental considerations, especially in busy public buildings of constant use. Floorings that perform better for life have design incorporated through the thickness of the wearlayer, usually up to 0.75mm, to ensure lasting looks. Whereas no wax, no polish, easy-clean, scuff and stain resistant surfaces with effective microbiological treatments, can be simply cleaned using just water and detergent making low maintenance budgets and less environmental impact from heavy duty maintenance routines possible. 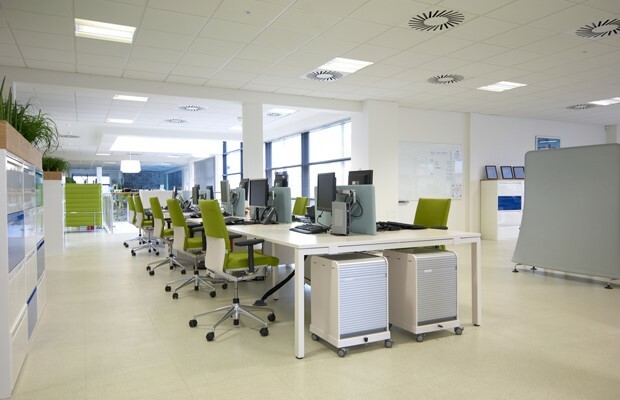 For where good looks count and also fast-turn around with minimal disruption are necessary, for example in shops, hospitality, leisure and office buildings, luxury vinyl tiles (LVTs) in loose-lay interlocking and removable methods of installation have been developed for super quick, straightforward refurbishment. These loose-lay systems install cleanly over most existing smooth surfaces taking as little as 4-5 hours. There is no need for adhesives or specialist tools and also the inconvenience to retailers is minimized allowing for extended opening hours. Loose-lay, fast-renovation, interlocking decorative tiles with high resistance homogeneous wear layers for heavier duty installations will also make for rapid fitting while premises can avoid closing. Like loose-lay LVTs, individual tiles can be easily lifted for replacement. In the housing market, statistics indicate that UK home ownership is on the decline and demands on the rental sector are on the rise, particularly private rental. In terms of refurbishment the need for quicker redecoration between tenants is increasing, notably in social housing stock which is being used for high turn-around, temporary accommodation. Advanced, textile-backed system, ≥36/R10 slip-resistant, luxury vinyl floorings that meet HSE guidelines are addressing common issues in housing, streamlining installation, lowering remedial work and bringing longer term value to housing projects. By eliminating adhesive, reducing subfloor preparation and accelerating installation times, lower on floor costs by up to 30% compared with standard vinyl have been made possible. In addition, this flooring type with a built-in waterproof membrane can be laid where damp is an issue such as in older properties without damp proof membranes. Leading flooring manufacturers are continually investing in innovative new technology to bring about better flooring solutions for contract and housing sector refurbishment projects. Global companies like Gerflor with expertise in many market sectors including healthcare, education, offices, sport, leisure, retail, hospitality and housing, can provide invaluable advice and advanced product solutions designed to meet both the demands of today and tomorrow.